Coca cola chicken drumsticks are marinated in a combination of soda, brown sugar, ketchup, and fresh ginger for a sauce that's sticky, sweet and yummy. Mix together first 10 ingredients in a large bowl or resealable bag. Add chicken and toss to coat. Marinate in the refrigerator for at least 1 hour, preferably up to 8 hours. Remove chicken and reserve remaining marinade. Bring reserved marinade and chicken broth to a boil in a medium saucepan. Continue to boil for 15-20 minutes. 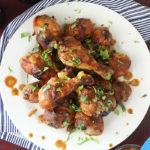 Arrange drumsticks on a large baking sheet and bake for 45-55 minutes, occasionally basting with reserved marinade mixture, until the skin is brown and crisp and juices run clear.